Melbourne radio producer Elena McMaster has recently returned home after a 12-month stint in Timor-Leste working with the country’s community radio association, Asosiasaun Radio Komunidade Timor-Leste (ARKTL). There she helped to install equipment in the community-run stations to allow them to broadcast listener feedback directly on-air. The new equipment also allows the stations to broadcast live crosses with journalists in the field. McMaster, who trained staff in the regional stations, said the development is an important one. McMaster’s work built on the support provided by two volunteer radio technicians, Michael Wasmund and Christopher Ross. They visited Timor-Leste in 2013 and advised of a need for special, yet simple, equipment to be developed. Using a smartphone and a smartphone cable, they were able to connect the phone to a station’s mixer and broadcast conversations. But smartphones were too expensive for the remote community stations so Melbourne-based 3CR community radio technician Riah Williams stepped in. He built a simple device to connect cheaper, more readily available mobile phone handsets to a radio studio. McMaster said the quick-to-install equipment works in Timor-Leste because the cost is reasonable. In Maliana, southwest of Dili, the local community station was able to broadcast its first talkback program as soon as the equipment was installed. “They were excited to be able to speak directly with listeners,” McMaster said. Six community stations, including those in Baucau, Oecusse and Maubisse, are actively using the new equipment. McMaster’s volunteer work was supported by Australian Volunteers for International Development (AVID), the Asia Pacific Journalism Centre and 3CR. APJC director John Wallace said, ““For many years we’ve been working with communities in East Timor to help support their community radio stations and promote greater engagement. “We see it is vital for the health of East Timor’s media, especially in remote areas of the country. McMaster is now working again with 3CR as national programmer and a trainer. 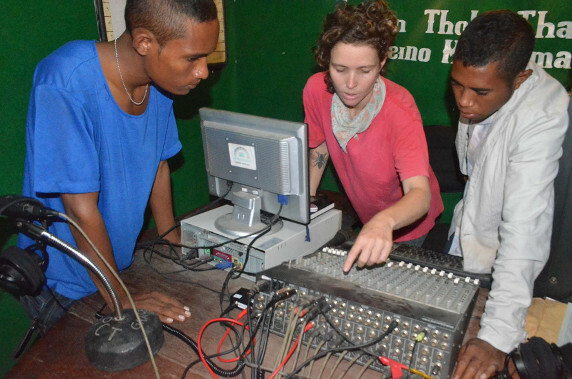 Photo: Elena McMaster reviews mixer connections (to enable recording) with staff at Radio Cova Taroman in Suai. Photo courtesy of Joaquim De Fatima Coutinho and Zelia da Costa.